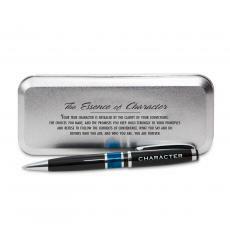 A perfect desktop gift combination this set includes a metal pen cup imprinted with a timeless motivational quote, paired with a matching theme inspired pen and case. The pen has polished chrome accents and marble accent barrel. The pen case features a matching printed quote. Choose from one of our most popular themes as your gift set.